It's been three years since Robert Plant released an album - he and country star Alison Krauss mopped up a few Grammys for the quality "Raising Sand". Well, hold onto your Stetsons because the charismatic front-man is back with a new line-up, a new album and, yes, a new tour. The project, new band and new album will be called "Band of Joy", named after the blues band he performed in prior to Led Zeppelin. Proffering a different line-up, he is joined on vocal duties by another country-singer of considerable note, Patty Griffin, as well as a stellar cast of session musicians from the US. As you may well gather, the new material continues Plant's exploration into Americana, bluegrass and roots-music, while not forgetting that all important rock n roll injection. The album, premiered recently in London, is released on 13th September which naturally means a tour is also imminent. 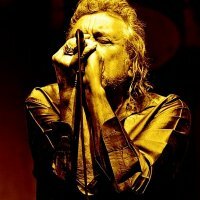 Following a tour of the southern states of America, Plant returns to the UK with a concert at the HMV Forum in Kentish Town on 2nd September, followed by four further city dates in Cardiff on 26th October, Birmingham (27th), London again (Palace Theatre - 31st) and over to Dublin on 1st November. Tickets go on sale at 9am tomorrow with prices ranging from £45 - £50 plus fees. If you have been following the TV series "I'm in a Rock N Roll Band", you will no doubt be aware that Led Zeppelin won the vote for Best Band, ahead of The Beatles and Queen, with John Bonham winning Best Drummer and Jimmy Page and John Paul Jones being nominated for their instruments of choice and Robert being pipped to the post by the late Freddie Mercury as best rock singer. A small tip of their huge legacy-iceberg, yes, but further proof that Plant and co carry considerable weight with them, some 40 years later. Both the Cardiff and Birmingham dates sold-out this morning, but extra tickets have just been released for both - check below for availability.